Sophie's friend Jay has added a Ouija board app to his phone and insists that they play with it. Not knowing anyone else to call, Sophie asks to hear from her cousin Rebecca who died several years before. The Ouija board seems to respond and lots of scary things happen in the diner where they are playing including Rebecca's spirit saying that Jay will die that night, a prediction that comes true. Still reeling from his death, Sophie goes to spend a couple of weeks with her cousins in Scotland. Her family lives in a former school where several students had serious accidents and a teacher died. Life for Sophie's family has also been filled with tragedy Besides Rebecca's death, her male cousin's hand was seriously burned, a cat died in a fire, her aunt is in an asylum, the youngest daughter is afraid of her own bones, and the cousin closest in age to Sophie vaccilates between being the nicest person ever and manipulative shows. 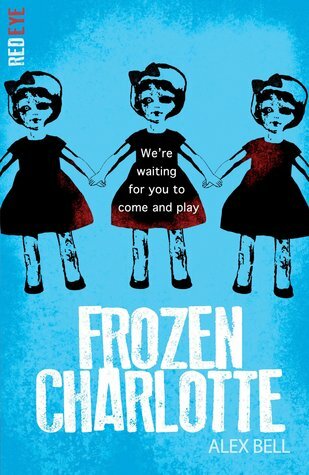 And what about all those Frozen Charlotte dolls that have been in the house for decades that seem to talk and move...? Like much horror, this is not the finest work of literature ever but it is horribly, wonderfully creepy. The dolls alone are terrifying and yet they end up being less dangerous than some other things in the house. Why Sophie's uncle would stay in the house is beyond me and why he is so oblivious to the talking toys and ghosts all around them is another mystery. I was kept guessing as to the real source of the danger when in most books it is very obvious so that was fun. It can be so difficult to find true horror for middle school ad this totally fills the bill. Bonus: it will be a breeze to sell just on the Ouija board alone.